One of the most memorable quotes for me from SuccessConnect 2018 in Las Vegas was at the key note from SAP CEO Bill McDermott: “The world is moving faster than ever before but remember that it will never move this slow again.” Feels like just yesterday everyone was fresh on their 2018 new year’s resolutions and now the year is over and it is 2019! I am sure many people in the SAP SuccessFactors space can relate since cloud software moves so fast. 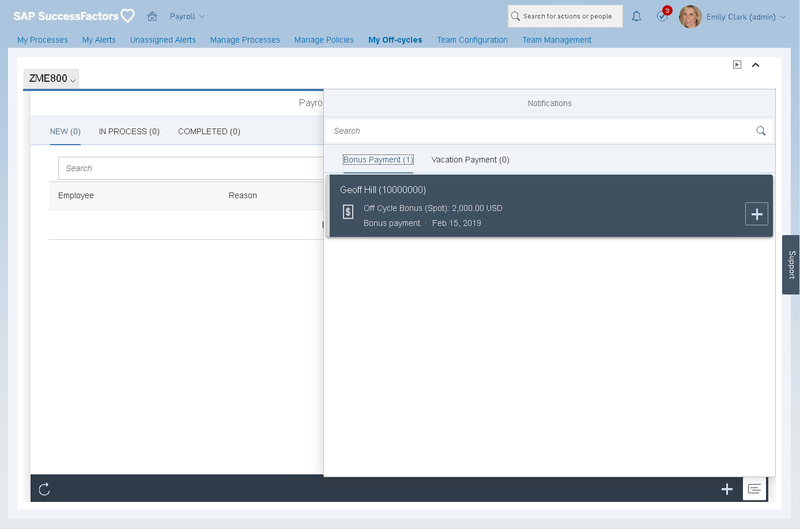 With that quote on my mind, I wanted to take time today to look at some of the major innovations in SAP SuccessFactors Employee Central Payroll (ECP) in 2018 before launching ahead into the new year. One of our biggest strengths at SAP SuccessFactors is we really understand localization while being truly global. SAP SuccessFactors Employee Central (EC) now supports 94 countries and ECP now supports 43 countries with the addition of Hungary and Kuwait in 2018! Last year I wrote a blog and recorded a video demo about our innovative Off Cycle Payroll User Experience. My video showed how easy it was to use this functionality and how powerful it was to organizations. It featured paying an off-cycle bonus (Ex: Annual Bonus) for the entire pay group or a large group at once and I got a tremendous amount of feedback and comments. In 2018 we have continued to improve the off-cycle functionality within our Payroll Control Center (PCC). We now support pay periods on demand, correction payments, vacation payments, individual bonus payments and more. From a usability standpoint we updated the “My Processes” user interface to distinguish between Off Cycle and Regular processes. 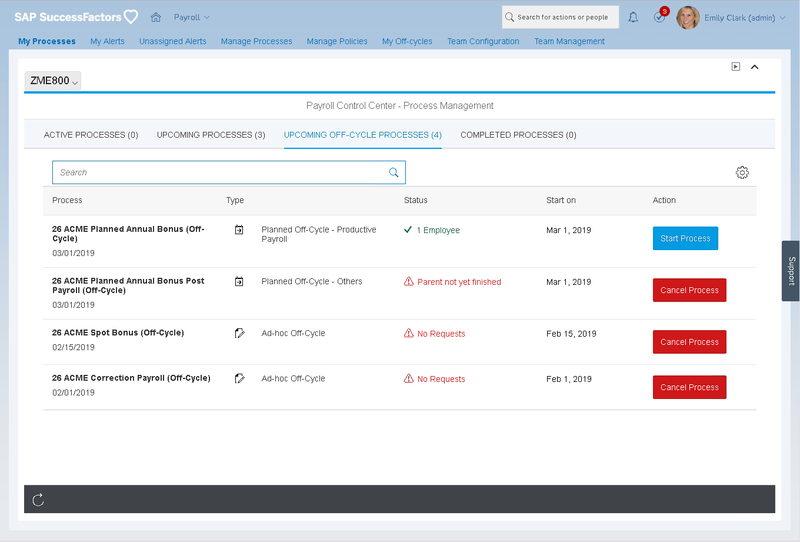 The new “Upcoming Off-Cycle Processes” tab is where Payroll comes to run mass off cycles as well as follow up activities (such as posting to FI, creating a direct deposit file, and paying vendors via third party remittance). In my screenshot below you can see the status field shows how many employees will be run and if there is no one to run we are given the option to cancel that process. One of my favorite pieces of functionality is our notifications button where you can pay individual or small groups of employees for things such as a bonus paid outside of the normal payroll. This notification button will track anyone who has an off-cycle payment such as a bonus that was entered but has not been paid through payroll. When you navigate to the My Off-Cycles UI you will see the new notification button at the bottom right of the screen as highlighted below. With a few clicks you can process the bonus payroll for your employee and easily repeat for anyone required who has a bonus entered. After we run all the employees who have this bonus we can easily process them together for post payroll steps such as initiating direct deposits and sending the results to FI or third-party remittance, etc. I recorded the following video as a demo to this functionality to explain it more than screenshots could. The other significant enhancement I wanted to point out is our new Teams functionality in the PCC. Alerts have historically been assigned directly to individuals with individuals having the ability to claim an alert, but many customers told us they work in a shared service environment or within a team of experts and the current framework did not fit their needs. We took this feedback and created this functionality that will enable customers to have an accurate and efficient payroll process. 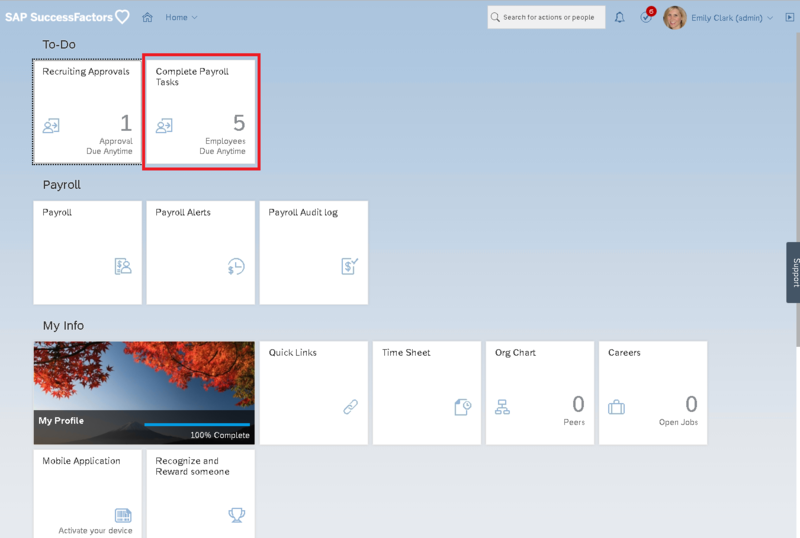 I wrote about this functionality extensively in my SAP SuccessFactors Employee Central Payroll Q4 2018 Release Highlights blog with many screenshots and a full explanation. Our Payroll Tasks functionality which is unique to ECP as it uses the point-to-point integration increases payroll accuracy by keeping the payroll team aware of critical changes via a home page tile when payroll relevant activities occur such as a new employee being hired, an employee changing addresses, an employee getting terminated, or any event reason a customer needs. The payroll task has been improved multiple times this year including based upon our customer requests. My blog for our Q4 2018 release highlights the most recent improvements which gives customers the flexibility to trigger this tile based upon their requirements, but I also wanted to highlight others that we have had this year. Here is a look at the home page tile and how it appears automatically after a data change takes place. One of the improvements we delivered this year is the addition of a status at the bottom which allows the end users to track when someone has started working on the employee events. There is also a filter to allow end users to focus on employees with a certain status such as “In Process” to see the information they are working on. Here is a look at the information when you click the tile. A big user experience improvement is providing additional information to the individual working on the tasks to include tasks details. The end user can now see why the tile was created, insight into the employee such as who their manager is, their pay group and more. This can be seen in the header information where we have a link for “See Task Details” that can be clicked for insight. The quick card button next to the employee’s name also allows the end user to navigate to that employee very easily. Behind the scenes we have made usability improvements such as if someone has multiple address changes in a period to only have one task with all the latest improvements. We have provided a new Business Add In (BAdI) to adjust the settings of the Payroll tasks to control the creation of the entries. 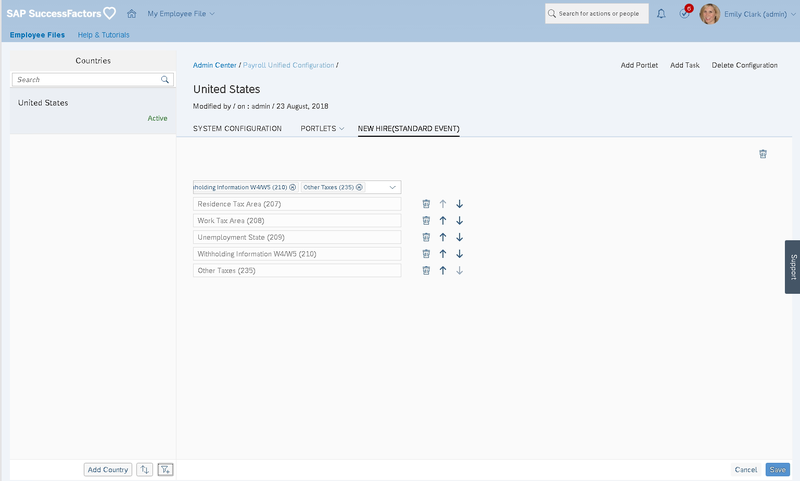 To make it easier and more efficient for customer and partners to setup and maintain the system we created a new User Interface called “Payroll Unified Configuration” which centralizes configuration that previously was in multiple places. 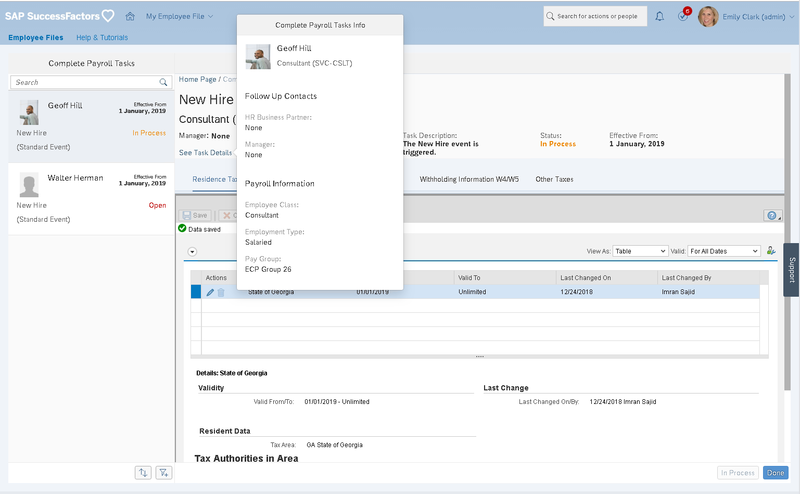 In this central UI, we control the details of the ECP system, what the end user sees when a tile is created in the “Complete Payroll Tasks” for the different use cases (Hire, Address Change, Termination, or your own event reason), as well as the information shown when you navigate to an employee’s record. 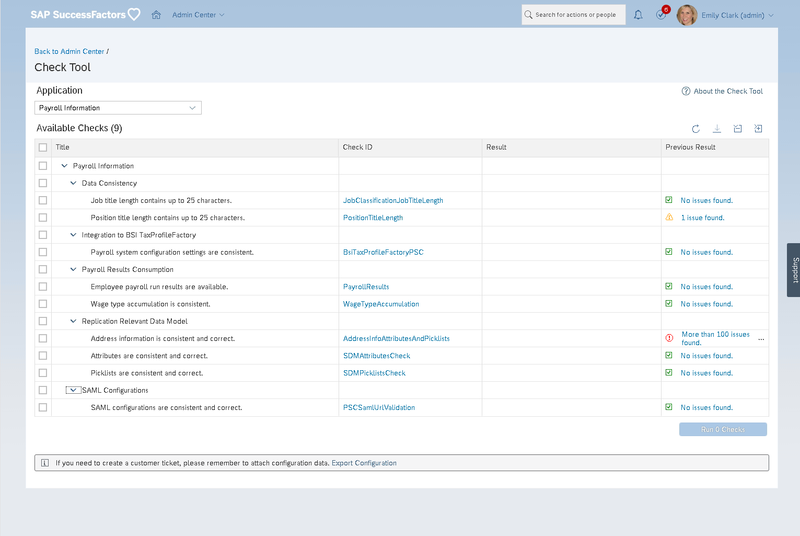 Another area of significant improvements is the enhancement of the Check Tools for Payroll integration which makes it easier to ensure the necessary fields, localization, and SuccessFactors recommended settings are followed to ensure there are less data related errors. The addition of these validations makes it easier during implementation and post go live processes. These are validations we have added over time as we have worked and listened to our different customers to understand common mistakes and point them out to existing and future customers. When you navigate to the check tool you can choose the “Payroll Information” application in the drop down and expand the different headers to see the specific checks that we have built in. 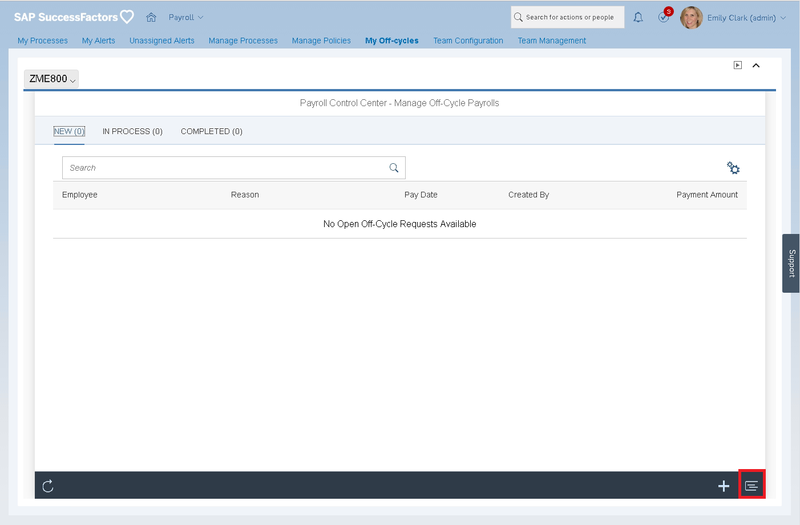 You can find helpful material on how to implement our latest functionality in the implementation guide on the SAP SuccessFactors Employee Central Payroll Help page. For practice and details on implementing the Payroll Control Center it is recommended to take our HRH65 course. This course is available as Instructor Led Training (ILT) or self-paced learning available on Learning Hub. If you would like hands on practice at your own pace, consider the SAP Live Access environment which gives system access to practice hands-on. 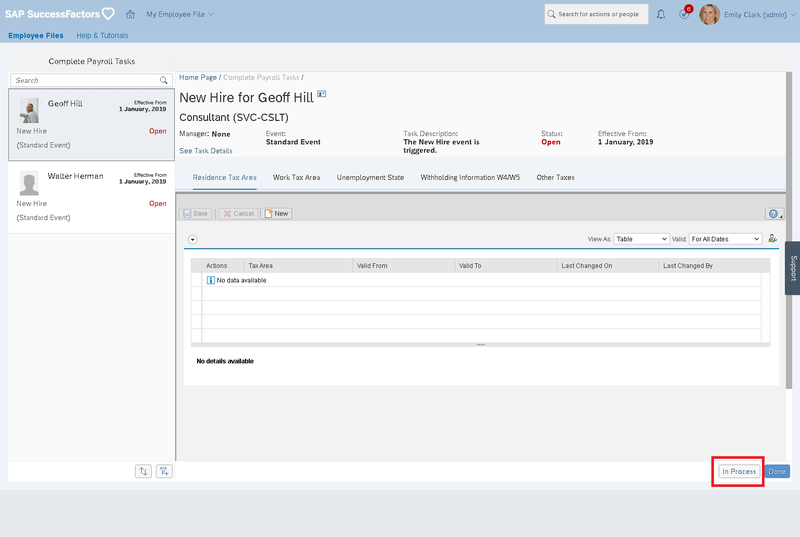 For a new customer it is recommended to take the HR809 SAP SuccessFactors Employee Central Payroll Project Team Orientation that allows major stakeholders to understand the core out of the box functionality available to guide correct project decisions for configuration workshops. For end users looking to understand business processes in ECP it is recommended to take HR812 SAP SuccessFactors Employee Central Payroll Administration both of which are available on the SAP Learning Hub. Employee Central Payroll – What is the Payroll Unified Configuration? Overall it was a very exciting year for SAP SuccessFactors with a lot of positive feedback from customers and partners with so many improvements and innovations such as the ones covered in this blog as well as my previous one. It is an exciting time in the SAP payroll space with ECP being the fastest growing product in the SAP SuccessFactors portfolio with triple digit customer growth for three years and a lot of innovation to look forward to in the future! Happy holidays to all! I hope everyone got to enjoy time with their family (although I know with Payroll year-end and go-lives sometimes it can be difficult). Hopefully 2018 was a very productive year and here is to 2019 being even better! Welcome to the Human Revolution. We are here to proclaim that the old ways of working no longer work for HR. SAP SuccessFactors helps you bring your organization’s purpose to life and more meaning to people’s work. You can instill intelligence across your HR functions to develop engaged, motivated teams. Together, we’ll create an inspired workforce that improves both performance and profit. Thank you very much Naga. Always try to keep people informed and appreciate the kind words and you taking the time to comment! Very nice job with this Imran and Happy New Year. Thanks Jarret and Happy New Year to you as well! Thanks Imran Sajid and it is not an issue of the PCC and documentation which you and your team have done a GREAT job of it is the fact that many SI’s are leaving it out of Employee Central Payroll projects so they can have a lower estimate to win the work or they dont understand it and sadly customers realize into the project that they are not getting what they saw in all the demos unless they sign an expensive change order. Thanks Jarret. I have seen improvement recently and am optimistic on continued improvement with initiatives by SAP that make it easier to implement along with wider availability of the educational content I mentioned in Learning Hub. I have also had a lot of promising discussions with SIs and seen there are more people in the marketplace that have implemented it successfully which is great. Ultimately if you implement the PCC correctly its all but assured you will have a happy customer and that will drive more work in the future. I will continue to try my best to help spread the message and enable success!